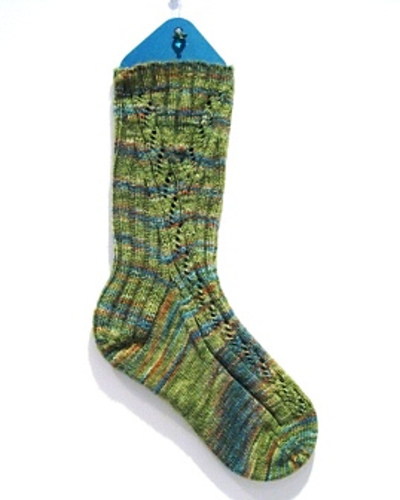 The Foot is the easiest part of the sock. Once you are back to X stitches on each needle just keep knitting around and around until you have 4X rows on your sock (including those rows from the gusset) OR you have approximately 2 inches left between the top of your big toe and your knitting. You know that knuckle like bump on your foot just below your big toe- stop about there. The Foot- Mine took 64 rows (4X). I don’t know if you can see in the picture but I use ring-less safety pins to mark every 20 rows. Finally we have to reduce down the stitches on each needle to produce a toe. The type of toe we are knitting is the basic wedge toe. To do this we do symetrical decreases at the end of Needle 1 and start of Needle 2, then at the end of Needle 3 and start of needle 4. Round 1: N1: K to 3 stitches before end of N1: K2tog, K1. N2: K1, SSK, K to end. N3: K to 3 stitches before end, K2 tog, K1. N4:, K1, SSK, K to end. From here, this is where I stray from the given pattern. Repeat these two rounds until there are ((X-2)/2) stitches on each needle. (so in my case 7 stitches. )Then knit just Round 1 until you have 5 or 6 stitches left on your needle. I prefer my toe a little wider, so I leave 6 stitches on each needle. 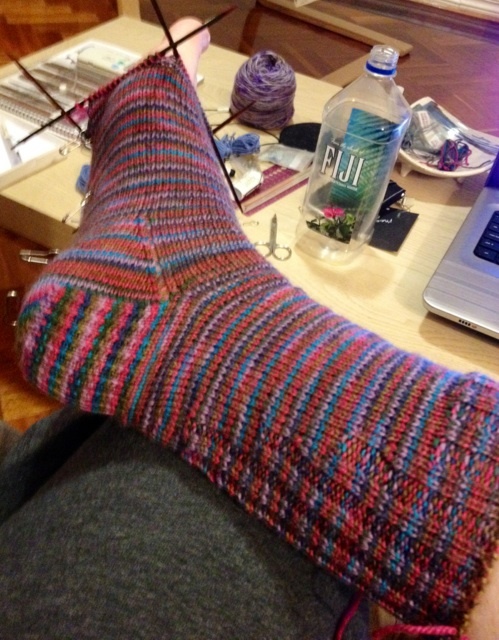 If you have narrower toes, knit till 5 stitches are left on the needle. Knit across just needle 1 once more. Then arrange Needles 1 and 4 onto one needle, and Needles 2 and 3 onto another. It is then time to graft or kitchener stitch the toe closed. This will make the bind off look like another row of knitting. The best step by step examples are found here or on video here. Once you have finished that, sew in the tails at the tow and cuff, sewing those first few rows into the round and YOU HAVE FINISHED……….. ALMOST. The most important part is yet to happen. Poor Single Sock. Finished June 2009. Other Foot- Not Yet Started. I have no idea about most of what you wrote here…. Great colours, what’s the yarn? I believe the second sock curse also applies to gloves. Thanks I’m not sure what the yarn is, I lost the label- I think it is from an old dyer who no longer opperates. I love this pattern. Where can I find it please.